Everyone loves this despicable meme. With all the attention the meme world pays to Minions, those inexplicably popular yellow creatures with googly eyes, it’s not often that their boss, Gru, gets the spotlight. But the Despicable Me villain-turned-hero finally got his own meme, and it’s a good one. The new Gru meme is all about what happens when you suddenly realize your plan wasn’t as foolproof as you’d assumed. “Gru’s Plan” comes from a scene in Despicable Me where Gru presents his arch-villainous scheme via teleconference but finds that his new kids have snuck in a drawing of Gru on the toilet. Embarrassing! The meme format was derived from that scene. Panels 1 and 2 are normal steps of a plan. Panel 3 is the surprise, the shameful step that wasn’t supposed to be there. Panel 4 is the same as panel 3, but now Gru has realized what he just said. More elaborate versions of the meme replace Gru with another character. Like … Hitler. Or Seymour Skinner from The Simpsons. This one is a crossover with the recent “Steamed Hams” meme. There are dozens more where those came from—mainly Twitter and Reddit. 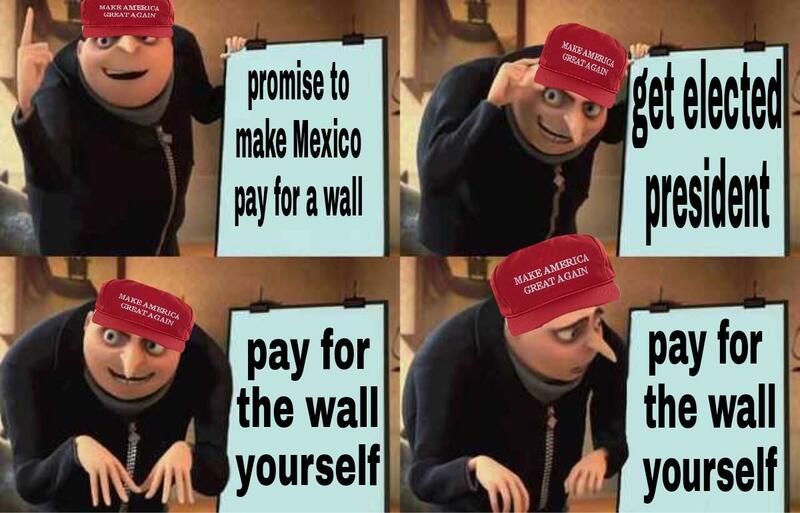 “Gru’s Plan” has been a highly successful meme for a couple of reasons: its format is incredibly easy to use, requiring rudimentary Photoshop skills at best, and it stars a very recognizable character. Even better, he’s a character who hasn’t already been overused by meme-makers. As one person on Twitter said, “Gru’s Plan is infinite and universal.” Although the plans themselves may have failed miserably, the meme will stand as one of the best of the season.